Coastal battles in the region included those at Forts Clark and Hatteras and at Roanoke Island in present day Dare County. Both resulted in Union victories. 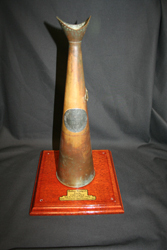 This brass hailing trumpet was used aboard the CSS Curlew which was involved in the attempt to repel Union forces at Roanoke Island. After being shelled and run aground, it was set on fire as the Confederates surrendered at Roanoke Island. 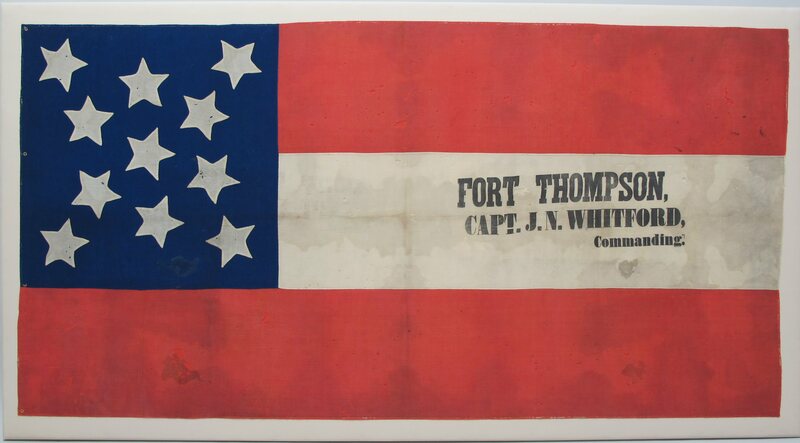 One of three flags captured at the battle of New Bern on March 14, 1862 by the 21st and the 25th Massachusetts Regiments who were from Worcester County, Massachusetts. The regiments were also involved in the Battles of Hatteras Inlet and Roanoke Island in present day Dare County and the Battle of South Mills in Camden County. 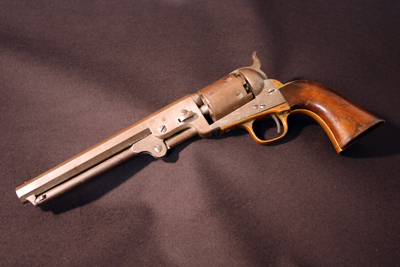 this pistol was used by Henry M. Shaw, Colonel of the 8th Regiment NC Troops. Shaw was in command at Roanoke Island when his regiment was captured by General Ambrose E. Burnside’s Union forces. he was later killed at the battle of new bern in 1864. 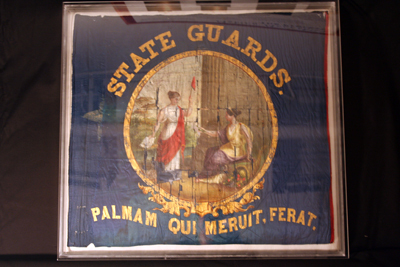 The State Guards, 17th NC Company L (1st Organization), flew the flag during the Battle of Roanoke Island. William C. Dawson of this regiment hid the flag remnant in his clothing when the company was captured.